If you haven’t yet seen this film, it’s astounding. 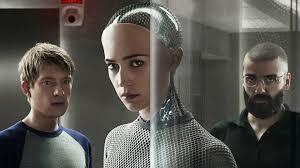 The actors, the sets, the cinematography, the plot and the music all come together to create a tell a gripping story of Artificial Intelligence where it’s difficult to know who to trust. I won’t throw in any plot spoilers, but as I watched this movie a second time (on Apple TV…just $5.99), I realized what a classic science-fiction movie this will become. If you haven’t seen it yet, go rent it. Or buy it. If you’ve seen it, watch it again. I picked up even more the second time around.